Stunning real artists studio loft, 3bed 2 bath, terrace. Calm, Light+terrace. Sleep 3- 10 in this loft ( 8 adults), huge space, quiet, with roof terrace. A fantastic , enormous space, very quiet and calm with a roof terrace and fully equiped kitchen. Full of designer furniture and original art, it's one of a kind. New beds and very comfortable. Ceiling fans and portable eco/air cooling units. Great for groups, hanging out, on three huge sofas, cooking and eating together, or just chilling out after a busy day being a tourist or at work. Easy to pop into the centre with UBER or the subway. Just 10/15 mins. Not suitable for noise and parties, this loft is part of a group of quiet working artists lofts. Fabulous master bedroom overlooks gardens and greenery with a whole wall of windows. Ensuite bathroom and laundry cupboard with washer/ dryer. Two more double bedrooms with platform beds for children/extra guests, and a separate shower/wc, off the kitchen area. Close to public transport and all tourist sites, including Eiffel Tower. Close to shops and market, 1 min walk, Huge market and mall with cafés and all you might need or imagine! Great for entertaining, family groups or business meetings/get togethers. There are house RULES which have to be respected in order to rent. No running around for children, there are parks next door. NO more people allowed in the loft than specified on the rental contract, even if not sleeping at the loft. Both the above can be waived by special permission , but the cost may change. The loft should be returned in the same condition in which you found it. There is a cleaning deposit to cover costs if it's not. Note there are cats and a dog wandering in and out of the loft on occasion and in the communal garden. Not suitable for those with cat/dog allergies. Look at face book , loft 11 Paris for more details and photos of the loft. This is my home originally although I travel a lot now and rent frequently, I ask for respectful clients who enjoy an unusual and artistic space. Artist, musician, therapist, mother, I have extra space right now, so I'm looking to rent to respectful people to share this amazing space.I am in an apartment downstairs. You may never have experienced such amazing space. Beautifully furnished, full or art and beauty. Most people say it's a really amazing experience. We give you lots of information about local shopping, restaurants and how to get around, what to see, books on walks etc. It 's a great retreat to come to, minutes from the centre, great access to ALL tourist destinations, direct on the RERC, but at a retreat from the commercialism of the tourist areas. 5 Mins to public transport to all tourist destinations , or walk or cycle down the river. Three Bedrooms 2 bathrooms in this apartment and three Bedrooms three baths for ground floor. Sometimes I can rent both together, please ask. Rare is it to find a space where you can gather with groups, or say three generations, cooking exploration, and minutes from the city centre. Beautiful space, huge sitting area to gather and chat, roof terrace for the sun. Close to subway , 5 min walk, access directly and easily all main tourist spots, including Eiffel tower, Notre Dame, Louvre. Parking easy and cheap, 3 euros a day outside. Great shopping market round the corner, and baker, restaurants etc. Light, quiet, vast, terrace for sunny meals... large groups of 6-11+ can fit in, but generally 6/7 adults plus children is the most comfortable. Very restful and chill out space, as well as beautiful. Fabulous for family get togethers where you want to cook and hang out as well as visit Paris. Upstairs, two baths, one en suite with master bedroom, with bath tub and hand shower, wc, sinks , and one shower room with wc, sink . All equipped, microwave, normal oven, dishwasher, , electric stove, pots pans etc. electric kettle, dolce gusto expresso machine. seats 8 and terrace table ..
French TV and some other channels. Très beau Loft, très spacieux. Bien placé, à 2 pas des quais de Seine. Place de parking toujours disponible. Très bon accueil de Magdalena. Je vous remercie de votre appreciation. C'est bien de savoir que le loft est commode pour les groupes de personnes d'affaires. Cordialement, et j'espère a la prochaine! Tucked into the streets of an old post industrial area, this spacious apartment/house presents an ideal showroom space or accommodations for a large group. Wonderful rooms brimming with designer furniture and world art of various scales, from miniature pieces to grand sculpture. Choose your mood, relaxed or intimate. 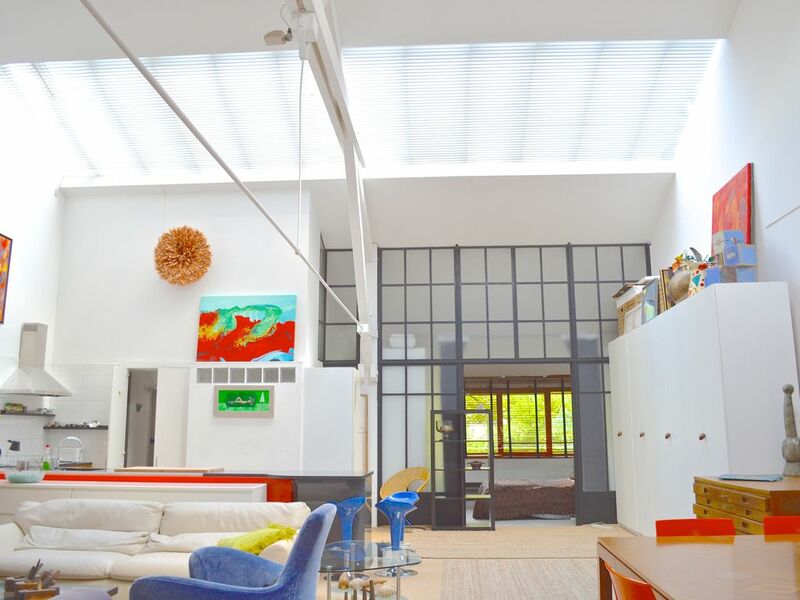 A massive skylight upstairs and a wall of green downstairs give the loft on each floor it’s own personality. Gentle quiet, lots of sunlight, and a focus on nature’s elements with a garden, create calm and set the stage for a tranquil and memorable special occasion! Add food cooked in the professional gourmet kitchen, bought around the corner in the huge market, and you have a perfect setting for dinner or drinks.The apartment’s residential and closed gated location lets you dive into the culture—meet the neighbouring artists or enjoy a private holiday at the edge of Paris’s famous landmarks. Here, you enjoy proximity to the left bank Latin quarter and the Notre Dame, and the Eiffel Tower all within a direct metro ride or a short UBER hop. We had an amazing trip with friends and family, and highly recommend this wonderful space! Thank you for your kind review, I'm so glad you enjoyed the loft and I hope you return to visit again soon. I know you hired some chefs to cook in, and I feel that's a marvellous idea to feed a large group without going to a restaurant. escalier métal 2 étages,étroit,abrupt,dangereux donc pour enfants,difficile pour personne ayant le moindre handicap moteur ou cardiopulmonaire;descriptif de 6 ch et 5 sdb!dispo 3 et 2 dont une douche+évier+toilette sans ventil sur 5,5 m2 donnant par porte non verrouillable!directement sur espace cuisine! Je suis vraiment desolé mais vous n'avez pas reservé toute la maison, vous avez reservé les trois chambres, les prix sont bien mentionné dans le debut de l'annonce! Il me semble que vous n'avez donc, pas lu l'annonce, ni le descriptif, et c'est claire que ce loft n'est pas du tout adapté a des gens qui ne peuvent pas monté un escalier. Je n'ai jamais reçu un mauvais avis a propos du confort du loft. C'est sûr qu'il est un peu 'funky' mais c'est la beauté de ce lieux. Ce n'est pas un hotel, c'est un loft d'artiste, confortable, avec une salle de bains manifique, et une petite salle de douche (et il y a une ventilation). Normalement la temperature est bien gerée par des ventilateurs et volets, donc je n'ai jamais reçu de plaintes. Je suis navrée que vous ayez eu une mauvaise experience, j'éspere que vous avez desormais passé un agreable sejour a Paris. Nous avons loué la maison pour un weekend entre amis. Le lieu est idéal! La décoration est à la fois originale et soignée. Il y a suffisamment d'espace pour que chacun se sente bien. La maison est parfaitement équipée. Nous avons profité de l'ilot central dans la cuisine, l'endroit de la maison le plus convivial! Côté pratique : il y a tout ce qu'il faut à quelques centaines de mètres et le metro n'est pas loin pour accéder rapidement au centre de Paris. Une adresse hautement recommandable! Je vous remercie Isabelle pour l'appreciation, et je suis vraiment contente que vous avez profités bien des lieux. Vous étiez les clients parfaits aussi! Amazing Place to live a dream stay! This place is such a find. We really enjoyed the stay. Everything you could need in the apartments and helpful suggestions from Magdalena. In this loft, you feel like you have come home. Magdalena take amazing care of you to arrange everything before your arrival. You truly feel like your are home. Just look at the other reviews, nobody gets almost perfect score! This is a superb place to stay - much nicer and better priced than hotels or people trying to make a quick buck from airbnb with hidden charges etc. Located in an unassuming building in Ivry, this is one happy surprise after another. This loft was a dream: comfortable in every way, quiet, incredible bath, cozy, with lovely furnishings and little touches that made our stay relaxing and comfortable. The decor of each room is charming, and living room is a lovely sitting area abundant with beautiful paintings. We had visited Paris many times in the past but have never stayed at any place more charming and delightful as this beautiful in close by the city. This loft is very close to transportation and easy to get around from. Magdalena was away but arranged everything before our arrival. The living room was a great space, really quiet and well equipped. Really all positives; go and stay there! The Dream! Ideal place to enjoy Paris and live incredible quality time moments with your family! We will never stay anywhere else now that we have found this loft! Highly recommended! Thank you so much for such a great review! I love my loft and I'm so glad you enjoyed it too. Please do come again, you were great guests too! Oh my goodness- we had SUCH an amazing time! Your loft apartments are just out of this world! We arrived late Friday evening after the best day of my life and we were all in complete ore of where we were staying! We couldn't have been happier- rob was such a lovely guy and the things that he brought was just perfect. He then kindly brought us some more baguettes and milk and stayed for a chat on Saturday early evening before we headed out for supper at LE George and then into moulin rouge!!!! It was a fabulous evening. I will of course write a review and I sincerely hope we can stay again at your home. We loved all the art work and thought you were so talented! With all the best to you and hope you have a great Christmas. Centre of Paris, 3 miles, 3 stops on subway or UBER or walk, and Disneyland close by 25 min drive. Cool post industrial artist neighbourhood with lofts in converted factories. Many local restaurants, St Miguel is the best super good value family run local, baker etc and round the corner a whole huge mall with Market and McDonalds, Crepes, Sushi etc. A few minutes away you have the whole choice of the left bank and St Germain as well as Bercy Village. Cycle or walk down the river, go running to the thousands of acres of woods and parc in the Bois de Vincennes across the river.